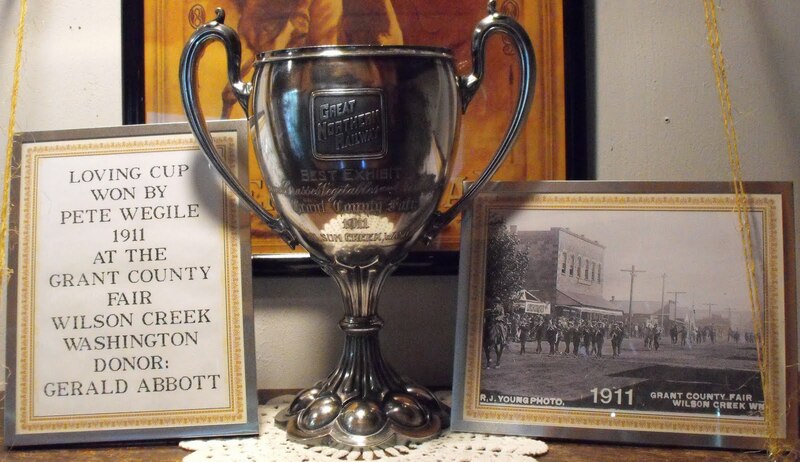 Back in 1911, this cup was awarded at the Grant County Fair, then based in Wilson Creek. It was awarded for "Best Exhibit (of) Grains Grasses Vegetables and Root Crops." It was on display at the 2009 Grant County Fair, now held in Moses Lake, as part of the Grant County Historical Society Display. The below information was gleaned from the Milwaukee Road email list at Yahoogroups.com. The Royal City branch never came close to paying for it's construction. expenditure of a spur and to support the expenses of spur operation. President Lutterman the need for a Royal Slope branch. Interesting to not the diminishing number of the subdivision, as BN abandoned others. Not sure exactly what happened between 1980 and 1982 -- I need to check. But by October 1986, the line was not listed in the BN ETTs -- the line was transferred to Washington Central. 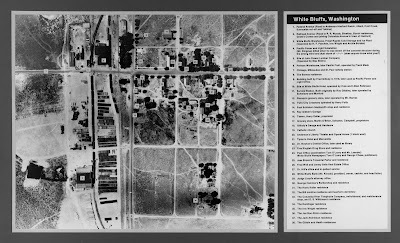 White Bluffs was a town on what is now the Hanford Nuclear Reservation. The town was bought out by the government. The 1960s was a time when the public thought of the railroads, if they thought of them at all, as something relegated to history. People were finding airplanes and automobiles much more to their liking; the new Interstate-5 freeway between Everett and Tacoma, for example, was expected to cut commute times by 50 percent. Seattle’s Boeing was producing its 747 Jumbojet, and working on its prototype for a supersonic civilian transport plane – the earliest precursor to the French-British Concorde. Floating bridges and hydroplanes rounded out the new technology popping up all across the state and country. The passenger train, though, was in its death throes. The freight side of the business was still somewhat profitable, but it was severely hampered by the Interstate Commerce Commission and its propensity to deny rate increases. The ICC also forced railroads to retain the failing passenger trains, causing a financial strain on rail lines. Many roads were near bankruptcy, such as the Chicago, Rock Island & Pacific, which sought a merger with the Union Pacific in an attempt to keeps its lines in the black. The ICC prevented the union for more than ten years, before “The Rock” finally slipped into bankruptcy in the 1970s. The “Standard Railway of the World” – the Pennsylvania Railroad – and its rival New York Central, both having been extremely successful railroads in their own right, were in major financial trouble when they merged in 1968. Their efforts did not succeed either. The Great Northern and Northern Pacific were doing well enough, especially when the profits of their subsidiary – the Chicago, Burlington & Quincy – were added, but business could have been better. They presented their petition to merge the two companies and their subsidiaries before the ICC. There were four such attempts: in 1896, 1901, 1927, and 1955. This last attempt lasted from 1955 until 1970, and though ultimately successful, it demonstrated the sluggishness of the Commission. The rest of the world seemed to be moving at a frenzied pace, engaging in public protests, political controversy, and technological advances beyond the imagination of previous generations. The public was enamored with the space race, fueled by the first manned space mission by the Soviets. The world saw the launching of numerous astronauts, cosmonauts, and various models of spacecraft into the heavens, until Grant County’s sixth decade closed with the Apollo 8 mission escaping earth’s gravitational field and orbiting the moon. Trains as an exciting frontier were relegated to the dusty tomes of history. Now hydroplanes found their way to the Columbia River at the Tri-Cities, military and civilian planes were speeding through the air daily, the microchip had been invented, and Boeing was testing their first Minuteman Intercontinental Ballistic Missile. Seattle also created the hi-tech Space Needle for its Century 21 World’s Fair in 1962, showing off the great leaps in technology for which the decade was known. Here in Grant County, though, it was business as usual for the railroad industry. Just days after the county’s fiftieth anniversary, the Great Northern announced plans to remodel the depot at Quincy. Ultimately it was moved slightly east, literally abutting its own foundation, and was extended by 52 feet to more than double its previous size. The Northern Pacific farther south began planning for its Wahluke Branch that same year. The Wahluke Slope, at the southwest corner of the county, was scheduled to receive its first water from the Columbia Basin Irrigation Project on 125,000 acres of dry desert land. NP agricultural director Ken Cook predicted record yields for the Pacific Northwest in sugar beets, potatoes, dry beans, fruit, mint and grains. At a cost of $6 million, the line was to begin at the mainline in Connell; instead it was constructed from Mesa’s mainline, and stretched almost 55 miles west to Mattawa, without any reason given for the change. At the same time, the Milwaukee had also submitted an application to the ICC to construct a line to the Wahluke Slope, crossing through the Saddle Mountains from Beverly southward. The company claimed it had been planning this move since 1912, and thus had first right to construct. The ICC again took its own sweet time in responding, leaving the Basin to flourish for eight years before issuing its decision. Two years later, in May of 1961, the Milwaukee Road’s Olympian was discontinued; the passenger service west of Deer Lodge, Montana, ended, leaving the GN’s Empire Builder and Western Star services as Grant County’s only passenger lines. 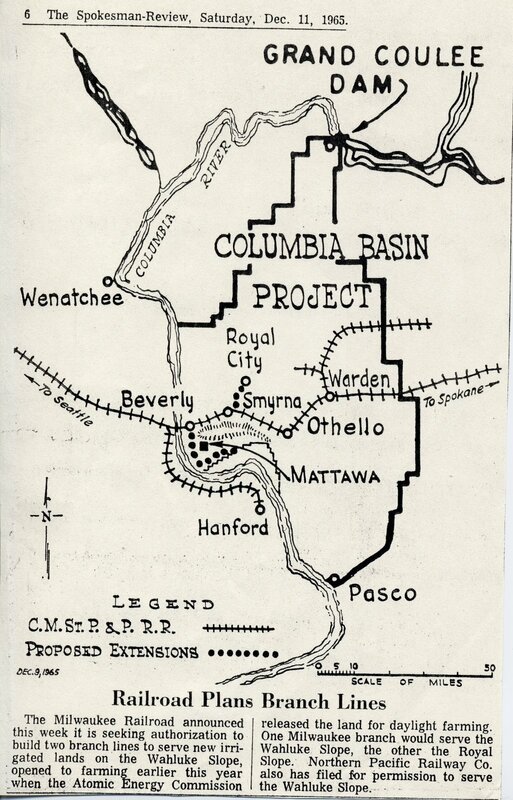 At this time, though, it seemed Washington State and the Columbia Basin were opening up to the world. In November, Martin Luther King Jr. visited Seattle as part of a civil rights lecture series there, and all of Seattle was in hot preparation for the world’s fair the next year. President Kennedy had announced plans to attend the fair, but cancelled en route to deal with the Cuban Missile Crisis. Closer to Grant County, the new steel tied-arch bridge across the Columbia River at Vantage opened in 1962; reports claimed it would “open the Columbia Basin.” The fascination with the new bridge improved highway conditions, ultimately contributing to more automobile traffic and less rail riders. On September 25, 1963, rail service in Grant County suffered another major blow. Food processing was fast becoming the foundation of the economic stability in Grant County, due to the Columbia Basin Irrigation Project; sixty percent of the land in the county was being used for farming. On this particular day, the factory at the Utah-Idaho Sugar Company in Moses Lake exploded, causing seven deaths, numerous injuries, and $5 million in damages to the plant. At a time when the plant was supplying enough sugar to supply the entire state of Washington for a year, the loss in business was felt by both the NP and the Milwaukee. Then, on November 6 – just two weeks before the assassination of President Kennedy – the GN suffered a devastating accident in Quincy, killing two trainmen and injuring many others. The eastbound local, dubbed the Alcoa Local for the aluminum ingots it carried from the plant at Rock Island, failed to stop at the siding and manually switch tracks. It plowed head-on into the parked mainline train of 144 freight cars, shredding the shell of the cab from its frame and telescoping four of the fourteen cars behind it into both air and soil. The leading locomotives on each train were so tightly twisted together that it was difficult to separate them, said the Grant County Daily Journal. The accident in Quincy’s business neighborhood also disconnected communication lines alongside the tracks, and blocked north-south traffic in Quincy for at least six hours. The engineer and fireman on the smaller switcher were both killed, and the engineer of the larger eastbound train was sent to Sacred Heart in Spokane unconscious and in critical condition. Others were released with minor injuries. The next year, the United States Supreme Court decided that most freight train and yard firemen positions should be eliminated. After rail companies made the switch from steam locomotives to the new, more-efficient diesels, the unions stepped in to retain these positions, though it had already become an obsolete job. The Supreme Court only confirmed what the railroads and the firemen themselves already knew to be the case: the rail industry was changing, and the employees were going to be required to change with it. Sometimes those changes weren’t instigated by the rail companies, though. In November of 1965, Moses Lake’s Larson Air Force Base finally closed, despite the new war raging in Vietnam. The government had long since discontinued use of the base as such, attempting to convert it into a regional missile base; these plans failed after the construction of three underground missile silos which were literally carved out of the basalt rock beneath the desert floor. Grant County residents worked tirelessly to convert the base into some kind of appropriate civilian use, finally settling on an airport alongside the new Big Bend Community College. The college began classes in 1962, and the airport opened for business four years later. This, too, affected business on the railroads. As a military base – and even as a missile base – supplies were shuttled in for both construction and operation, and out for distribution or transport to other bases. Now, business on the Milwaukee spur into the former base slowed to a crawl. Further north, Coulee City adapted to the changes with high hopes for progress. 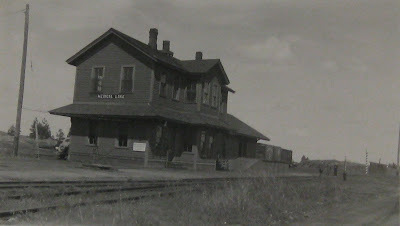 The Northern Pacific depot was remodeled to accommodate the expected business generated for Grand Coulee Dam by the truck loading facility at Odair. The nondescript white warehouse had been constructed in the 1950s to offload supplies for the dam, from NP trains arriving in Coulee City onto trucks, which would then transport the materials around the now-full Banks Lake irrigation reservoir. The NP assumed that, due to the upcoming construction of the third powerhouse at the dam, there would be a great deal of paperwork generated by the influx of supplies by rail. The second story of the depot was removed, and the main floor was strengthened and updated, something that had not been done since it was built in the frontier days of the 1890s. Construction on the depot was expected to be completed about the same time that construction on the powerhouse started, but the latter didn’t happen until the following year. Coulee City seemed to be the only bright spot in Grant County’s rail future, though. To the west, the Great Northern depot at Crater, just northeast of Trinidad, closed in 1966. This wasn’t a surprise, considering that less-than-carload freight – smaller amounts of parcel deliveries than required a full railcar – had dropped from 51 million tons to less than 2% of that in the previous half century. Smaller stations simply were not profitable. Other forms of shipment were beginning to take hold across the state, as well as the nation. The Grant County airport opened in October of that year, and over the next year and a half, Boeing announced both the 737 passenger jet and the 747 Jumbo jet. On the ground, Interstate-5 opened between Everett and Tacoma on January 31, 1967; when the Everett to Seattle section opened two years earlier, it created such excitement for drivers that three accidents occurred during just the opening ceremonies. Despite all this, the ICC granted the NP authorization to construct its proposed branchline to the Wahluke Slope on October 5, 1967. It denied the Milwaukee Road’s similar request, claiming that the NP’s plans served the entirety of the new farming region, compared to the ICC’s understanding that Milwaukee’s plan would only serve 1/3 of that area. Other reasons involved the cost of constructing a line through or around the Saddle Mountains, the reasonable inclusion of the produce from the Wahluke into the Yakima or Tri-Cities markets, and Milwaukee’s reactionary attitude toward the NP application for construction authority. The Milwaukee fought the decision, petitioning to have the case reopened. 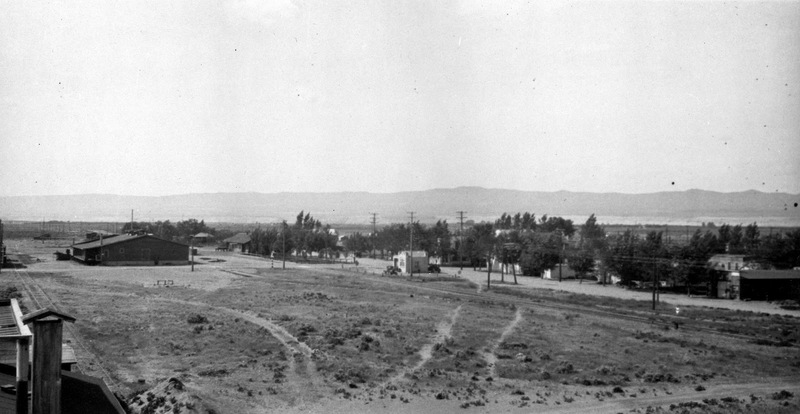 It argued that it had long intended to provide rail service to this area as soon as irrigation was offered there, and that the potential of 100 cars would be more appropriate to their small-scale local service in the Royal Slope region than to the NP’s 19,000 cars in the Yakima market. The ICC held its ground, granting authority only to the NP. Other than this heated dispute, railroad activity in Grant County was quiet in the late 1960s. Construction materials for Grand Coulee Dam, grain and produce grown in the Columbia Basin, and products generated at the county’s processing plants continued to be shipped across the rails. As the 1970s approached, these activities continued but did so under efforts to consolidate railroad services into only a handful of large railroad empires. The years of railroad competition within Grant County were drawing to a close. What happened to the WCRC? The info below is a cleaned up version of a document for the Railroad Retirement Board. I present it to clean up the date of the purchase of the WCRC into the BNSF, and the creation date of the CBRW (called CBRC below). According to information provided regarding this company, as well as the documentation on file, on December 4, 1996, WCRC was merged into a new subsidiary of the Burlington Northern Santa Fe Railroad Company (BNSF) called BNSF Acquisition, Inc. (BAI) with BAI being the surviving entity. According to Mr. Todd Leinbach, Controller of WCRC, WCRC operations ceased and employees last performed compensated services on December 3, 1996. Mr. Jeffrey Jensen, Assistant Director of Taxes for BNSF, indicated that no protective payments were made in 1997 by BAI/WCRC. According to information provided in July 1996 by Mr. Brig Temple, the then-President of WCRC, employees of WCRC were either retained by BNSF or hired by Columbia Basin Railroad Company, Inc. (CBRC) a new railroad company formed by some of the stockholders of WCRC, and found to be an employer covered by the Acts effective December 4, 1996. The merger of WCRC into BAI has been approved by the Surface Transportation Board (STB) (STB Finance Docket No. 32974, decided October 24, 1996). Based upon the information summarized above, it is determined that Washington Central Railroad Company, Inc. ceased to be a rail carrier effective December 4, 1996, the date it merged into BNSF Acquisition, Inc.
View from a Northern Pacific inspection of the property. Report is squirreled away in the Interstate Commerce Commission filed in Washington D.C.
A note about NP depots. The second story was quarters for the agent and family, as when this branch was established, there were no places for anyone to live. Most stations on the CW branch, such as this one, were of the same design.